Summer seems to be the theme of my illustrations recently. For two different projects I’ve been drawing children gardening, exploring butterflies, and climbing birch trees. But on this dreary fall day I have a short break to paint something for myself. For inspiration I look through photos and sketches from my time at Huyck Preserve, and by the evening I have a new species for my portfolio. 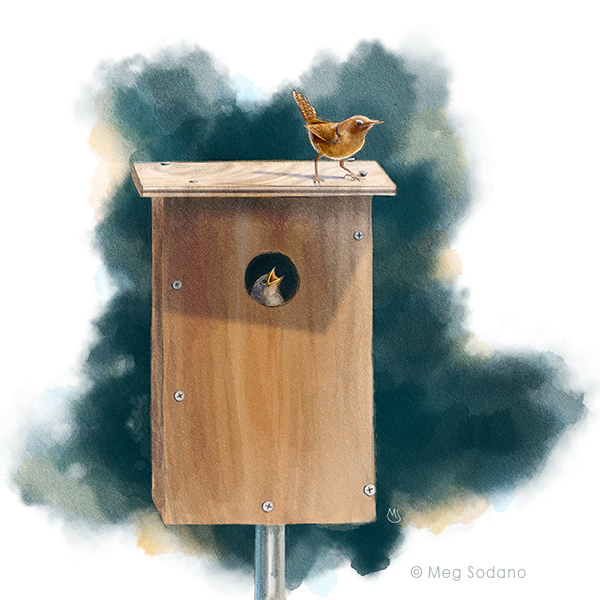 This House Wren, who tirelessly made trip after trip back to the nest box to feed the hungry, peeping mouths inside, was a character I saw frequently on my walks around Myosotis Lake. The nestlings fledged in the last few days of July, just before I left.